To find out who they don't ! The Trade Reference Network is comprised of businesses in the building trades who get credit references from each other on potential credit risks. When you extend credit, you increase the risk of not getting paid. For the most part, the payment terms you set are based upon customer credit references. what you need to know is how customers pay their subcontractors! 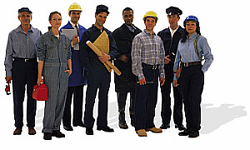 paid other subcontractors - businesses like yours. Think of all the time, money and aggravation you will save by knowing up front that your customer is a proven credit risk. © 2001 Trade Reference Network Inc.